So, you’ve caught the cooking bug and you want to try your hand at a few recipes you’ve seen online. Enthusiasm is one thing, but without the proper equipment, you’ll have a hard time getting the results you want. Unfortunately, knowing which pieces of equipment are more important when you’re just getting started and you’re on a tight budget can be difficult. Here are some essential kitchen tools every aspiring cook should have. Good knives are the backbone of every good kitchen. Without a good set of kitchen knives, not only will the whole thing be less enjoyable, but much more dangerous as well. Contrary to popular belief, you run a much higher risk of getting severely injured using blunt knives, primarily because you have to apply more pressure when using them. You don’t need a full set of knives at first, but a few are essential. You should be able to get by with a good chef’s knife, a paring knife, and a serrated knife. But if you’re going to buy only one knife, then go with the chef’s knife. You'll be able to cut just about everything you need as a beginner and you can add the other pieces later. If you don’t know which brand to choose, visit a review site like www.knifeista.com and look at various models. A cast iron skillet is an essential in any kitchen. Whether it’s to sauté vegetables, sear a steak or for braising, nothing beats a cast iron skillet. You might be tempted to go for a set of non-stick pans, but you won’t get the same results. They’re convenient, sure, but if you want to get that nice crispy sear on your steaks, you won’t be able to get as good a result on any other surface. Another plus about iron skillets is their strong construction. Iron retains heat much better than aluminum and will last twice as long. And forget that myth about iron cast skillets being more difficult to maintain; they take a but a few seconds to clean and dry with regular dishwasher soap. A 12” skillet should be more than enough for anything you’re trying to do. 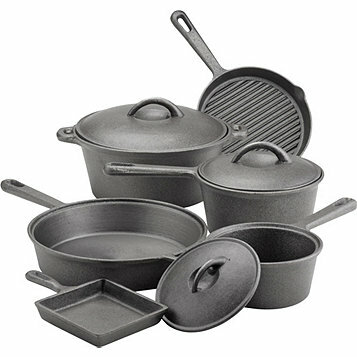 And the best thing is that they’re rather affordable; you can easily find a top quality skillet for under $20. In addition to a nice cast iron skillet and a good set of knives, you might want to invest in a few accessories like a set of measuring spoons and cups. Measurements play an essential part in most recipes and you can’t afford to guess like your grandma used to do. No need to go crazy here; you can find everything you need at your dollar store. With these three pieces of equipment, you should be able to start experimenting in the kitchen. Once you get your feet wet, you can start adding some new pieces depending on which type and area of cuisine interests you the best.